John Pringle Nichol was born on January 13, 1804 in Hunly Hill, in Forfarshire, Scotland. He was the eldest son of John Nichol a gentleman farmer and his wife Jane. He attended grammar school in Hunly Hill and went to Kings College in Aberdeen, winning highest honors in mathematics and physics. After graduation he served as headmaster in the grammar school at Dun. He held a number of headmaster positions until in 1836 he was appointed as the regius professor of astronomy at the University of Glasgow, a position he beat out Thomas Carlyle for. The duties of this position took little of his time, the rest of which he devoted to astronomical observation and public lectures. Nichol's lectures were noted not only for their rhetorical power, but also scientific accuracy. His lectures were an inspiration to the young William Thompson. Nichol's used his public lectures to popularize the nebular hypothesis, the theory that the solar system originated from a nebula. This is the current theory of how the solar system formed. Nebulae are large clouds of hydrogen gas. Gravity among the hydrogen molecules causes them to clump together. Stars form from the clumps of hydrogen when the gravitational pressure causes the hydrogen to begin nuclear fusion creating helium. This process takes over a hundred million years in the case of a sun sized star. Nichol was responsible for the erection of new observatory on Horselethill in the west end of Glasgow and his family lived in a attached house. 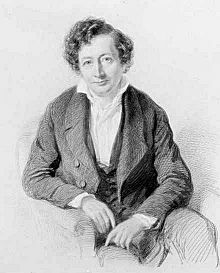 In addition to his public lectures Nichol was a prolific writer, publishing many popular books of science. His most famous book Views of the Architecture of the Heavens went through seven editions in seven years and won praise from popular writer George Eliot. He died on September 19, 1858. Clerke, Mary Agnes; "Nichol, John Pringle"; Dictionary of National Biography, 1885-1900; Vol. 40. Anon. ; "John Pringle Nichol"; Biography from the University of Glasgow.